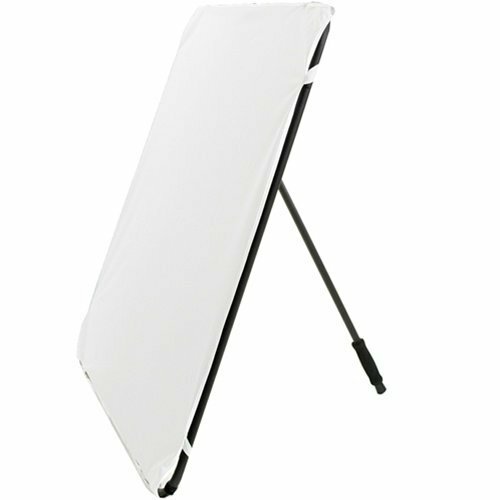 The RPS Studio Self-Standing Reflector Panel's aluminum frame measures 1 meter square and is extremely lightweight, yet rigid and durable. It folds to half its open size via inner connected spring loaded tubes. The frame can be mounted on a light stand that has a 5/8" spigot, and the angle can be adjusted up to 180 degrees via the included 5/8" receiver and lock. Comes with aluminum arm for adjustability, two reversible cloth reflector panels (one sunlight, one silver, both with white backing), and a nylon storage pouch.